Provide comfort for the family of Helen Hayes with a meaningful gesture of sympathy. Helen Marie Hayes, Professor Emerita of Computer Science at Marist College and former President of the Violin Society of America, passed away at her home in Wappingers Falls on March 31, 2019. Helen was a devoted wife, mother, and grandmother who will be lovingly remembered by her family including Joseph Regh, her husband of 30 years, her sons Richard Gegenwarth (wife Daisy) and Robert Gegenwarth (wife Maura), stepchildren Karen Latter (husband James) and Thomas Regh (wife Patricia), as well as her six grandchildren. Ms. Hayes was an educator for much of her professional life, starting at the College of St. Elizabeth in Morristown, NJ where she earned her B.S. in Mathematics, then served as a teacher and Catholic nun in the Sisters of Charity of Saint Elizabeth. After graduating with a Masters degree in Physics from Fordham University in 1966, she left religious life and worked first at Perkin Elmer in Stamford, Connecticut and later at IBM in East Fishkill, New York. At the time, Helen was one of three professional women at the IBM facility. Returning to her roots in education, Helen first served as a Board member in the Wappingers Central School District, then taught at Mount St. Mary College in Newburgh as a tenured Professor of Physics. In 1983 she completed her second Masters degree in Computer Science at Syracuse University, and became a tenured Professor at Marist College where she continued to teach Computer Science, Physics, and Cosmology until her retirement in 2013. In addition to several technical papers, her passion for Cosmology drove her to author a textbook used at Marist College and the adult education program at Bard College. In addition to her academic and scientific career, she served for eight years as the President of the Violin Society of America, a non-profit devoted to the art and science of making and restoring bowed stringed instruments. Her tenure shepherded in a period of growth . She enabled the examination of instruments including the Stradivarius Messiah violin, which helped establish dendrochronology as an important tool for modern violin experts. An avid traveler, Helen and her husband Joseph travelled each year, eventually covering the globe from Russia to South Africa, Thailand to Nepal, Germany and the Galapagos Islands. Always quick to engage others, Helen made many friends across the globe. A memorial Mass will be held at 2:30pm on Saturday April 13th at Marist College Chapel. 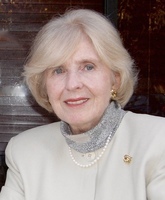 In lieu of flowers, the family requests donations be made to the Professor Helen M. Hayes Scholarship fund at Marist College, which supports students majoring in Computer Science based on academic achievement and documented financial need. Contributions can be made online at www.marist.edu/give. In the box marked "please direct my gift to" specify the Professor Helen M. Hayes Scholarship. In lieu of flowers, the family requests donations be made to the Professor Helen M. Hayes Scholarship fund at Marist College, which supports students majoring in Computer Science based on academic achievement and documented financial need. Contributions can be made online at www.marist.edu/give. In the box marked "please direct my gift to" specify the Professor Helen M. Hayes Scholarship. Consider providing a gift of comfort for the family of Helen Hayes by sending flowers.